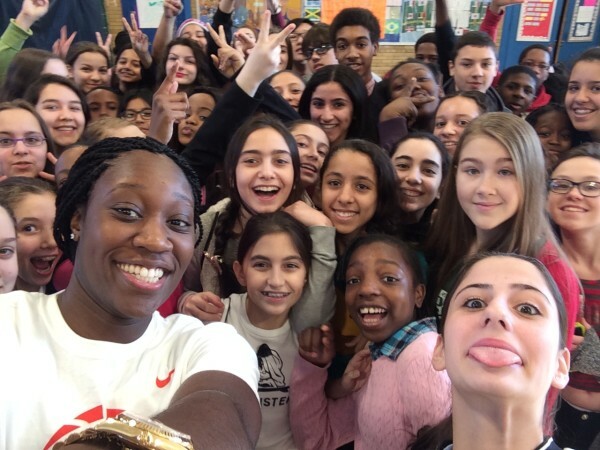 On February 13, 2015, at Cunningham Middle School in Brooklyn, New York, Safe Kids Worldwide partnered with WNBA All-star Tina Charles’s Hopey’s Heart Foundation, to activate an interactive sports safety clinic. 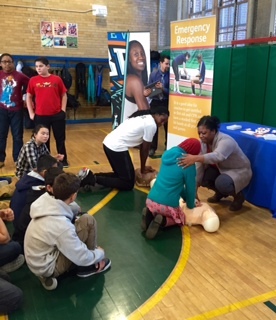 The sports safety clinic featured interactive stations on proper hydration, concussions, acute and overuse injuries and emergency response including the importance of CPR and AED use. Each station provided key messages and engaged attendees in interactive activities to reinforce key steps they can take to stay safe. Charles, the founder of Hopey’s Heart Foundation, addressed nearly 500 students about the importance of sports injury prevention and strategies they can use to stay injury free and in the game. 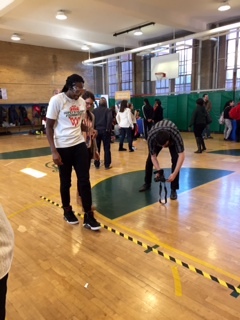 Cunningham Middle School was selected by Safe Kids New York City for participation in the clinic after winning the Beat the Street contest, hosted by NYC Department of Transportation. Beat The Street is a walk to school competition for children from ages 11 – 13 years old that encourages pedestrian safety and walking as a healthy activity. 753 Cunningham students participated in the competition, walking a total of 10,500 miles by the end of the four-week competition. After the clinic, the participants took home valuable information on ways they can prevent sports-related injuries, and what to do if an athlete goes into sudden cardiac arrest. Safe Kids has a unique approach for engaging kids and adults of all ages in interactive stations that provide education on sports injury prevention. By utilizing exciting speakers and experts, Safe Kids provides communities with an event that will make a lasting impact and empower attendees to change behavior when it comes to sports safety. The goal is that each attendee leaves more knowledgeable on how they can prevent sports related injuries and keep athletes in the game. Join Tina and help increase the amount of lifesaving AEDs placed and CPR Certification nationally, by making a match contribution for every rebound made in the 2017 WNBA season here. 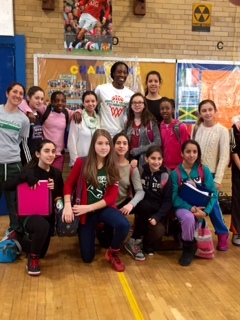 JOIN TINA CHARLES AND BECOME A PART OF THE HOPEY’S HEART GIVING CIRCLE- INSTALLING AED’S SO THAT LIVES CAN BE SAVED. Or use the Mail Form!